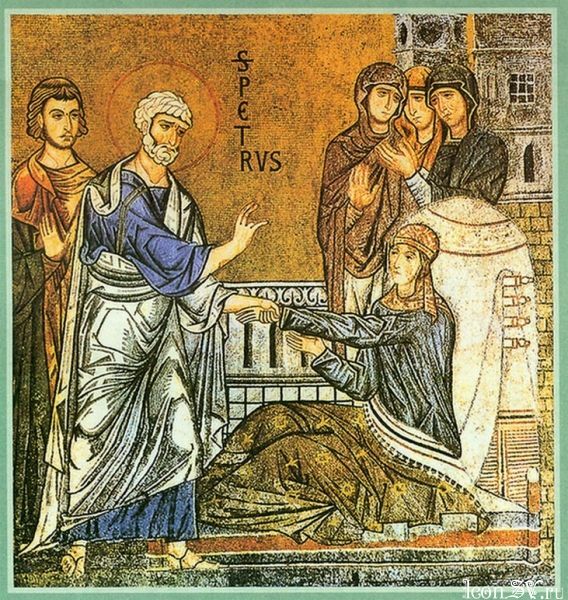 Saint Tabitha, the widow raised from the dead by the Apostle Peter, was a virtuous and kindly woman, belonged to the Christian community in Joppa. Being grievously ill, she suddenly died. At the time, the Apostle Peter was preaching at Lydda, not far from Joppa. Messengers were sent to him with an urgent request for help. When the Apostle arrived at Joppa, Tabitha was already dead. On bended knee, Saint Peter made a fervent prayer to the Lord. Then he went to the bed and called out, “Tabitha, get up!” She arose, completely healed (Acts 9:36). With the flow of the many-streamed river of almsgiving / You watered the dry earth of the needy. / Showering alms on the widows and the poor, / You shone with the light of your works / And were radiant with grace, O Tabitha. / Glory to Christ who loves you! / Glory to Christ who has blessed you! / Glory to Christ whom you followed as a true disciple and a spotless lamb! You served the Savior in holiness / By your God-fearing deeds, / And were a model of love as his disciple. / O Tabitha, we praise your memory!